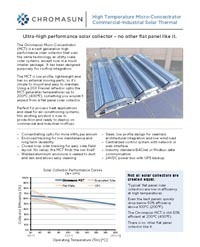 The Chromasun Micro-Concentrator (MCT) is a next generation high performance solar collector that uses the same technology as utility scale solar systems, except now in a much smaller package. It has been designed purposely for rooftop integration. From the outside, MCT has a familiar flat panel format. Like a flat panel collector, MCT is easy to install, weighs about the same and is just as easy to look after. Yet MCT can produce much higher temperatures and efficiencies than a flat plate collector and is subsequently capable of doing much more for you on the rooftop. Sunlight enters the MCT panel through the glazing and is reflected off Fresnel mirror strips. The light is then concentrated as it is focused on the receiver. The receiver contains a stainless steel pipe that is selectively coated to absorb the concentrated sunlight, yet not lose heat. The pipe receives up to 20 times concentrated sunlight and so easily acheives a working temperature of up to 400°F (204°C). Any suitable heat transfer fluid can be circulated and heated in the receiver pipe. Common fluids used are; pressurized water up to 40BAR; water glycol mixtures at ambient pressure and; thermal transfer oils. In addition, fluids such as potable liquids, sludges and slurries may be heated. Chromasun MCT panels mount to rooftops just like a flat panel. Comparison with traditional flat panel collectors. 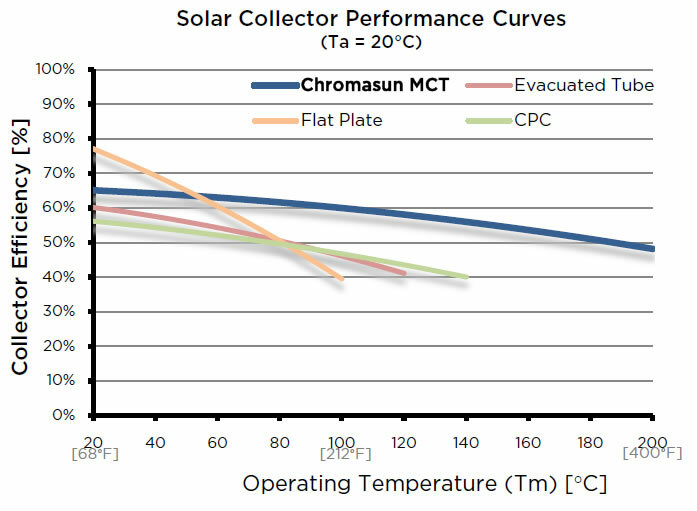 Chromasun MCT offers collection efficiencies that exceed traditional flat panel collectors once the fluid temperatures rise beyond 50°C (122°F). 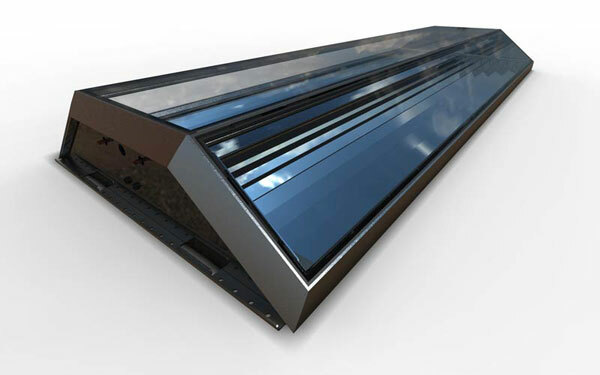 MCT harvests more energy from sunlight than any other flat panel collector in these conditions. Better collection effiencies mean more energy from your rooftop and the ability to supply at higher output temperatures without penalty. Until now the only way to achieve such high performance was to deploy more complex concentrating systems. Now Chromasun MCT brings that performance to the rooftop with far less complexity and the convenience of a flat panel. At a constant 176°C (350°F) test temperature, Chromasun MCT-HT acheived the highest temperature rating ever tested under the SRCC Standard 600 "Test Methods and Minimum Standards for Concentrating Collectors”. 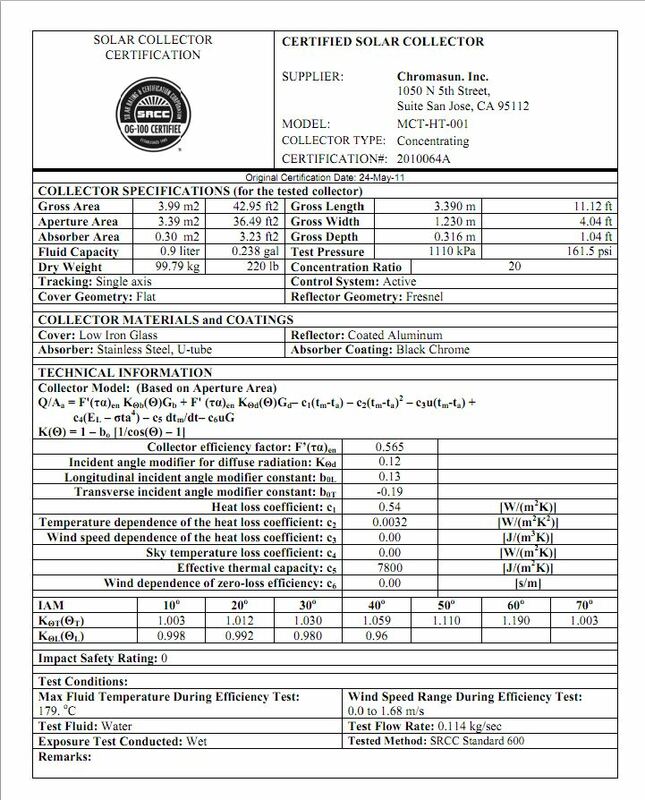 Chromasun MCT is subsequently certified under OG-100 which is the principal rating for all solar collectors in the United States. Chromasun MCT-HT has also met the EN 12975-2 European Standard for Solar Concentrators. 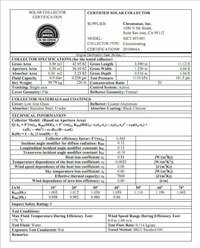 Chromasun MCT is rated under the SRCC Standard 600 "Test Methods and Minimum Standards for Concentrating Collectors”. Chromasun MCT is subsequently certified under OG-100 which is the principal rating for all solar collectors in the United States. Summary of Chromasun MCT features and specifications. United States. 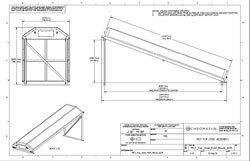 General Assembly drawing showing exterior dimensions of the Chromasun MCT panel tilted ready for typical flat roof mounting. 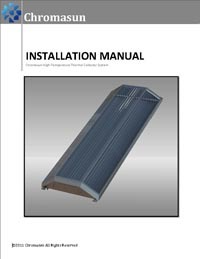 Detailed installation manual for Chromasun MCT system. 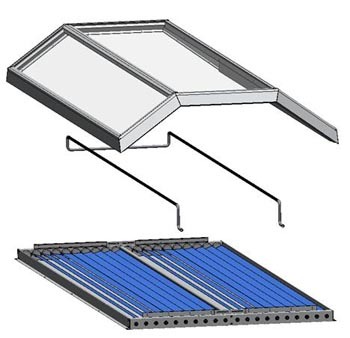 Manual shows typical roof preparation and detail of wiring and plumbing requirements for Chromasun MCT.